Wotofo Nudge Squonk Box Mod Review - Daily Vaping Deals & The Best Vape Product Reviews at Vaping Cheap! Squonking has become incredibly popular, especially towards the end of this year, so we’ve been seeing many Squonk mods and atomizers being released. Wotofo has finally entered the market with their Nudge Squonk Box Mod. This vape company is well known for their excellent quality and solid performing products. What’s even better is that everything Wotofo releases are incredibly affordable, including the Nudge Box Mod, which comes in at around $35! Before getting any further, we’d like to thank MyVpro for sending this vape mod our way for the purposes of this review. We’ll cover our first impressions, usage, performance, pros and cons, and conclude with whether or not we recommend the Wotofo Nudge Squonk Box Mod! Click Here to Check Out the Wotofo Nudge Squonk Mod! The Wotofo Nudge Squonk Mod does come in the new Wotofo packaging which is mostly green in color. It’s definitely nice to see a minor change in the packaging to keep things fresh. On the front, you’ll see an image alongside the name of the product inside. On the back, there’s some information such as manufacturer information, caution, and shows exactly what’s included. Once you open the packaging, you’re greeted with the Nudge and the spare squonk bottle. Inside the box, you’ll also receive additional fuse plugs and a user manual. Both of the included Squonk bottles are the “smoked” color, which I personally like, but that may not be for everyone. 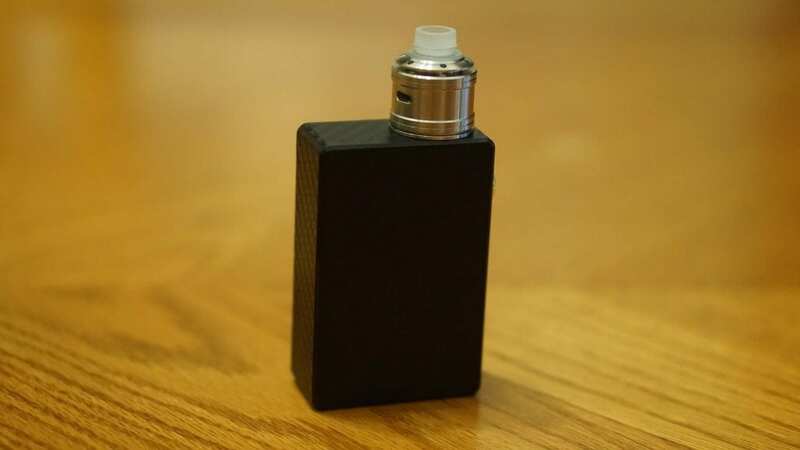 My first impression of the Nudge Squonk Box Mod is that it’s really small, and it’s to be expected since it’s a single 18650 squonk mod. In addition, there’s no board or chip inside as it is unregulated. Both the fire button and 510 connection are gold plated, which should provide excellent conductivity. The button itself is quite similar to the Stentorian Ram Squonk Mod, but not nearly as firm. This one is much easier to press. The Nudge is also very lightweight, and this is also expected since it’s primarily constructed of plastic. Even though this is the case, it still feels great in the hands with no sharp edges to be found. The entire device does have a carbon fiber design, which again is subjective and some vapers may like it and some may hate it, I personally think the carbon fiber looks great. Something to mention is that the additional squonk bottle doesn’t include the metal housing or top piece the pre-installed one has. I would’ve liked to have seen it come with one as you would have to take off the one included on the pre-installed squonk bottle in order to use the spare. 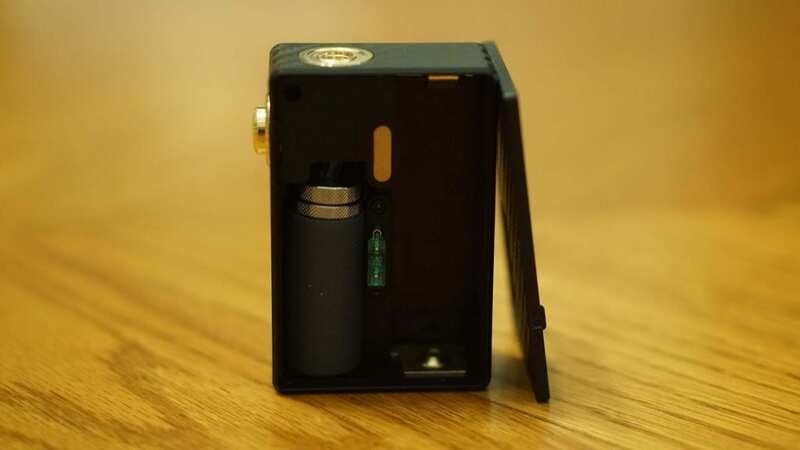 A good thing is that this device does not have a proprietary squonk bottle system like the one seen on devices like the HCigar InBox or Geekvape GBox Squonk Kit, so you can use aftermarket squonk bottles if you wanted to. The squonk cutout is also fairly large and bigger than most other single 18650 squonk mods for sure, which is a pro in my book. 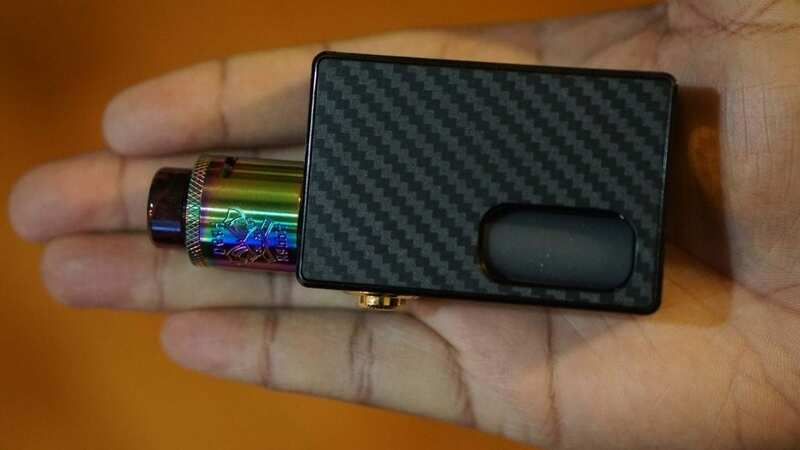 You can easily squonk and vape with one hand. Another pro to be mentioned is the fuse that’s pre-installed, as this adds a measure of safety when using this device. From what I understand these fuses are rated at 30A, which is a good thing for sure. All in all, my first impressions of the Wotofo Nudge Squonk Box Mod was great! I had no real cons to be mentioned in my first impressions. 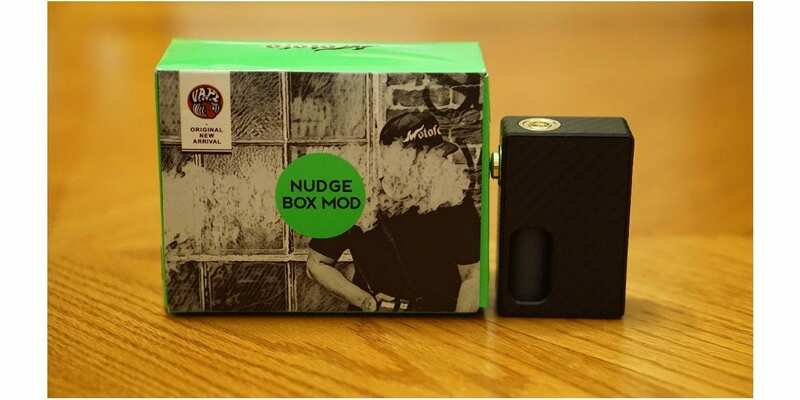 As mentioned earlier, the Wotofo Nudge Box features a compact design with no sharp edges whatsoever, so it’s very comfortable to use even for extended vaping sessions. It can easily fit in your pocket or bag, but I don’t necessarily recommend this as it is unregulated. It does feature a locking mechanism in the firing button, where you twist to lock it, but it’s not easy to do this. There is knurling around the fire button, but even then it’s still not easy to lock and I found my fingers slipping almost every time I tried to lock the firing button. Honestly, I didn’t care too much about locking the fire button since I wasn’t taking this device out with my much. This is something I pretty much do with all my unregulated or fully mechanical vape mods. However, it’s still a con to be mentioned and I do wish they implemented a different locking feature. The fire button is on the “squishy” side rather than clicky, but it is easy to press. Also, I never once had it misfire or act up in any way, which is definitely a good thing. Every time I hit the fire button, it fired right away without any delay. I found that after using it for some time, it did break in a bit and was a bit better, but that’s not saying it was bad to begin with. The internals of the device is also very clean and well done. Everything around the 510 connection is hidden, and this area is where you’ll also find the magnet which holds the door in place securely. There is zero play with this battery door, and I never once felt like it would come off. The fuse is located under the magnet and can be replaced if need be by simply pulling out the old one and inserting the new one. Something worth mentioning is that there is no battery orientation, so it doesn’t say whether the battery goes positive up or positive down. I’ve been inserting my battery positive down. This is a con in my book, as there should be some type of indication on how to insert your battery. There’s also no battery strap, which may be a con to some, but I haven’t had an issue with taking out the battery. Taking out your squonk bottle is very easy, and the squonk bottle is constructed out of silicone. It is easy to squonk with, but not too soft where it takes forever to expand. I’ve had zero issues with the included bottles, and I actually liked them quite a lot. Each bottle does have a 7ml e-liquid capacity, and the metal housing at the top does have knurling, making it easy to take off and put back on. The tubing could have a bit more of a tighter fit, but not to the extent where I felt it was an issue. All of my atomizers I’ve attached has sat flush and made a connection thanks to it’s spring loaded 510 connection. 24mm atomizers may look like it overhangs, but it really doesn’t. It appears to since the edges are beveled, but they look great in my opinion, so I’d say atomizers up to 24mm will look good on the Wotofo Nudge Box Mod. Overall, using this device has been a great experience. There were some cons to be mentioned, but none that were deal breakers in my opinion. The Wotofo Nudge Squonk Mod is unregulated; therefore it’s extremely important to understand Ohm’s Law, Battery Safety, and coil building. Since being unregulated, the wattage output will be determined by the resistance of the attached atomizer and battery state. With that being said, I preferred to use this device with a single coil RDA, but install a relatively larger coil build with a slightly lower resistance to achieve the vape I wanted. I also used dual coil atomizers as well and they performed just as good, but had a bit more of a ramp up time. My preferred coil build was a single Stainless Steel Fused Clapton (24GA SS316L/36GA SS316L) which had a resistance of around 0.2 ohm. With single battery devices like the Wotofo Nudge, I would also recommend simple round wire builds such as 22GA Kanthal or Ni80, especially in a dual coil RDA, as there’s much less ramp up time when compared to a Fused Clapton. In addition, I do recommend using good high drain 18650 batteries such as the Sony VTC5A, Sony VTC4, and the LG HB6. The Wotofo Nudge Squonk Box Mod does hit quite “hard” and hits a lot better than I originally expected. Of course there’s voltage drop to consider, but I got a really good vape experience using my preferred coil build. There was very little ramp up time with a lower resistance single SS Fused Clapton, and I would get a warm and saturated vape every time. As mentioned previously, Squonking with this device is done quite easily thanks to its soft silicone bottle and large cutout. Now it does have a 7ml e-liquid capacity, but I would recommend not filling it up all of the way to the top since you want to leave some room for the top piece and tubing. You can fill the squonk bottle with any e-liquid bottle since it does have a large opening. Now, even though it does have a 7ml capacity, how long it’ll last you will determine on how much you’re vaping. I can easily plow through all 7ml within a few hours if I were chain vaping, but if I was vaping moderately, I could easily get through most of the day. The same can be said about battery life, it’d be determined by how much you’re vaping and the resistance of the attached atomizer. With a single 18650 device, you can’t really expect all day battery life, but I could get a solid 3 to 4 hours of vaping relatively heavy with a Sony VTC5A. The last thing I wanted to mention is that I didn’t experience any leaking whatsoever. Some squonk devices do have leaking issues whether from the bottle of 510 connection, and I’m happy to report there weren’t any of those issues present with the Nudge. Overall, the performance of the Wotofo Nudge Box Mod was solid. I had zero complaints when it came to the performance of this squonk mod. In conclusion, the Wotofo Nudge Squonk Box Mod is an excellent performing squonk mod. Best of all, it’s incredibly affordable. For the price point, it does exactly what it needs to and does it quite well. The included squonk bottles work great, and I didn’t experience any leaking at all, which is a huge pro. It’s very lightweight and feels great in the hands. Even though there’s a lot of pros to this device, there were some cons to be mentioned as well such as there being no battery orientation, and the locking switch not being the best. In addition, I would’ve liked to have seen an extra metal housing or top piece included for the spare squonk bottle, but this isn’t the biggest deal in the world, especially when you consider the price of this mod. With all that being said, I can easily recommend the Wotofo Nudge Squonk Box Mod. It’ll serve as a great and inexpensive entry to those looking to get into squonking. Just be sure you understand ohm’s law and battery safety when using this type of device, as there’s not many safety features implemented like you’d find in regulated box mod.